In celebration of everything snowflake, ornament and holiday, Tory Burch is hosting a charity shopping party in her meatpacking store. 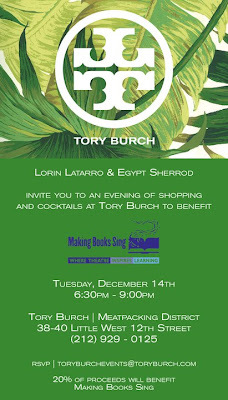 Dress up chic, grab some friends and join Tory, Lorin Latarro and Egypt Sherrod for a lovely evening of complimentary cocktails, with 20% of all proceeds to benefit Making Books Sing on December 14. RSVP below.